Devises et Emblemes Anciennes & Modernes, Tirees de Plus Celebres Auteurs; 1699; Kroniger & Göbel, Augspurg. Beautiful 17th century book showing various emblems with mottos described in German, Latin, French and Italian, and the emblems themselves described only in German. 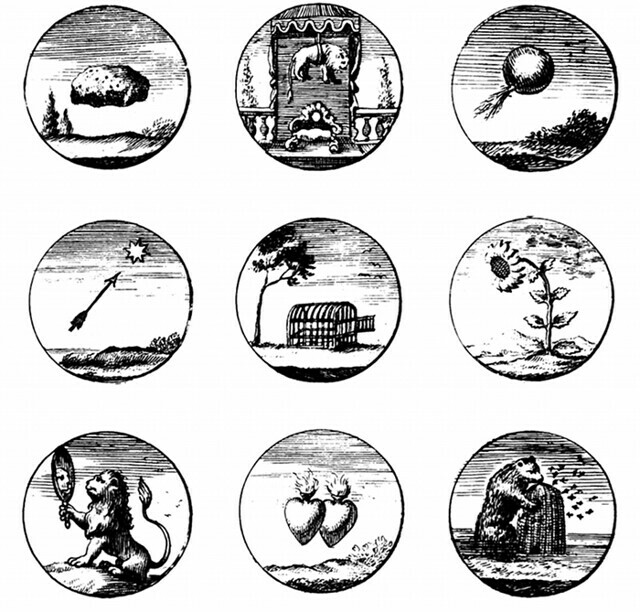 Some highlights include a floating stone, a lion being suspended over an empty throne, another lion gazing into a mirror and a flying ball. Here are a few choice examples, cut out and “cleaned”.